It’s always funny to think how palates evolve. While Marni and I were never picky eaters, there were definitely foods we avoided and loved at an early age. With the start of the school year, I can’t help but think back to our go-to lunch choices in kindergarten. Marni does not like to admit it now, but savored bologna and mustard sandwiches while I opted for roast beef and mayo. There were also some foods we were rarely exposed to and at first taste, despised. Marni hated tomatoes and Swiss cheese as I stayed far away from eggplant. Years later as our taste buds matured, we acquired a love for now two of our favorite vegetables. 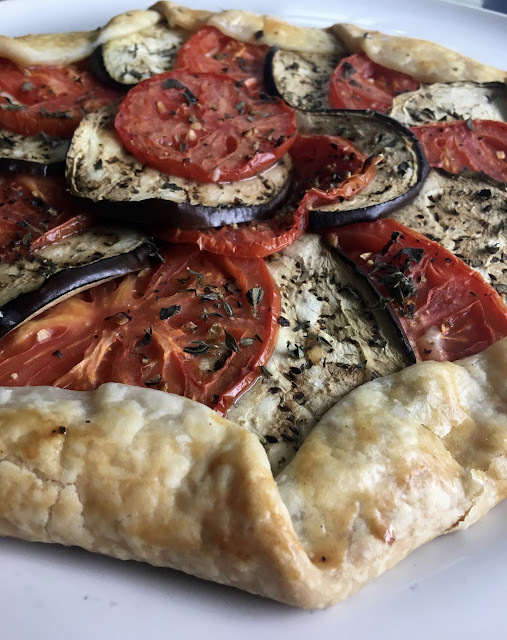 At a seasonally appropriate gathering, I decided to feature juicy heirloom tomatoes and subtle eggplant baked atop a creamy Swiss cheese layer in a rich and flaky crust. 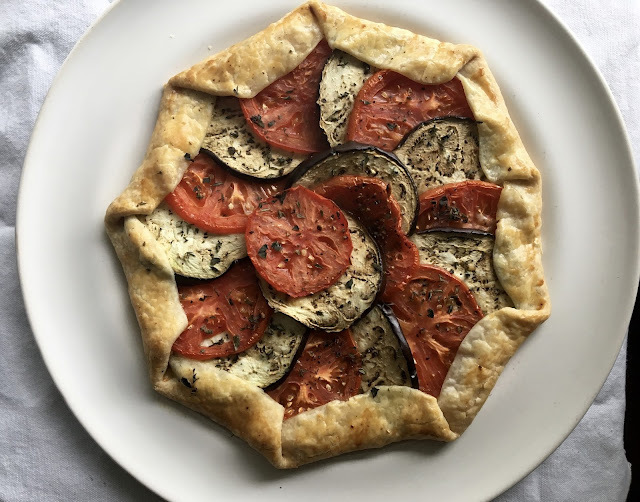 Topped with a drizzle of olive oil and sprinkling of fresh thyme, this galette is our top lunchtime dish. On a floured surface, roll out the chilled dough into a 1/8-inch thick circle. Transfer the dough to a baking sheet topped with parchment paper. Drizzle the dough with EVOO and sprinkle the Swiss cheese and Parmigiano Reggiano on top, leaving a 1-2-inch border all around. 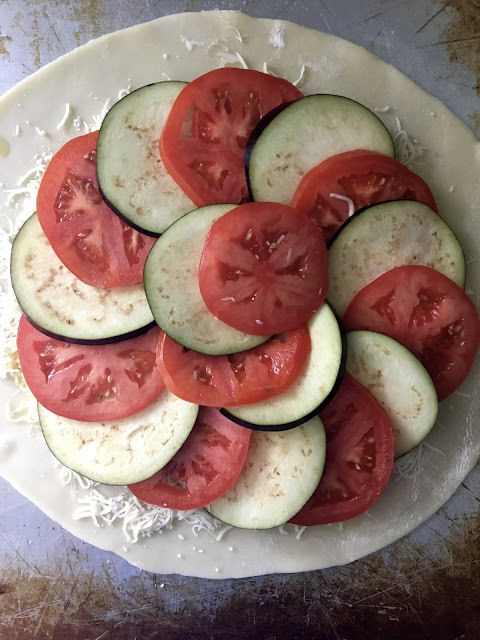 Overlap the heirloom tomato and eggplant rounds in a fan on top of the layer of cheese. Sprinkle with the herbs, salt and pepper. 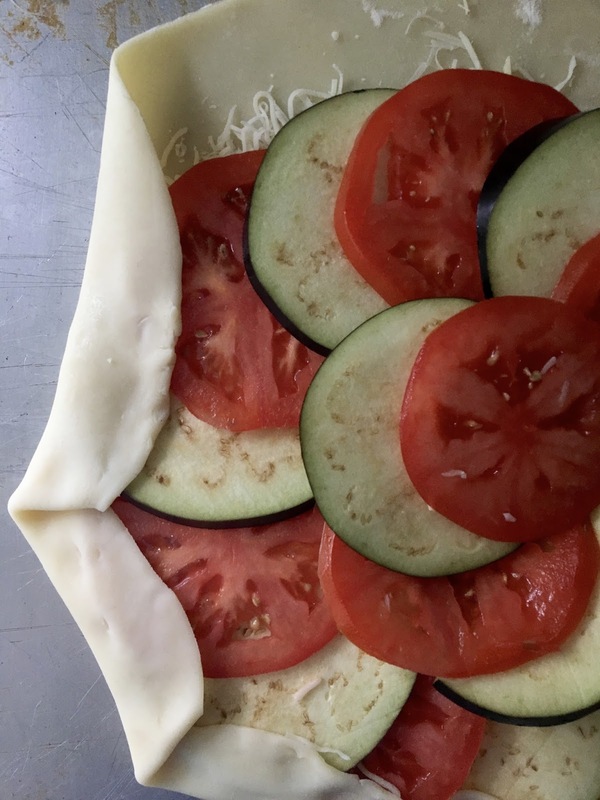 Fold the edges of the dough up over the filling. Brush the entire surface of the crust with the beaten egg. Bake until the crust is golden brown and the vegetables are tender, about 40-45 minutes. Serve warm with an extra sprinkling of Parmigiano Reggiano cheese. Serves 4-6. 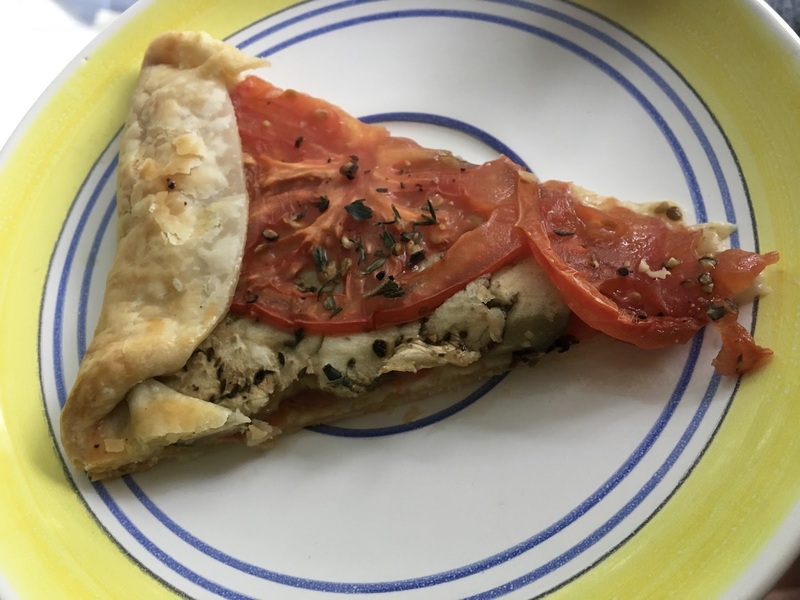 While I paired our kid lunches with an apple juice box, I paired our savory galette with a chilled glass of Sauvignon Blanc.